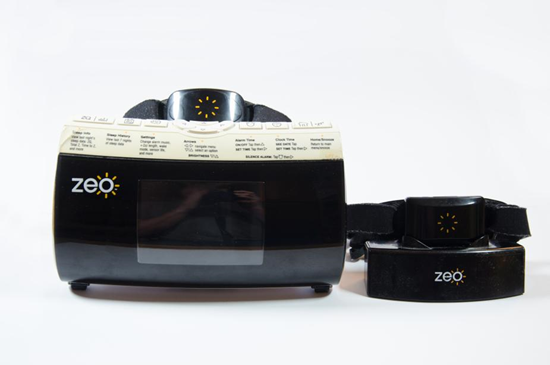 The Zeo is a small headband that contains a single-channel EEG. 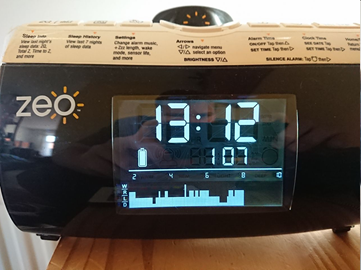 The company produced two major versions: a Bedside model (photo left) with integrated alarm clock, and a Mobile version that connects to phones over bluetooth. The accuracy of the readings is fairly high, at 75%1 – 81%. 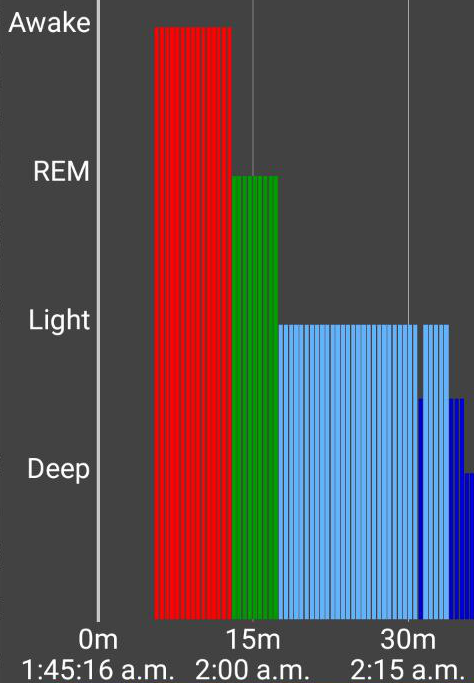 The readings are shown as a hypnogram, so already categorized per sleep type. This makes it easy to interpret the data. Measuring starts when the device is taken off the charger, and stops as soon as it’s placed back. The Zeo Bedside is the earlier product. The headband communicates exclusively with the clock, so no phone connectivity. The last sleep is shown on the screen in front, together with the “ZQ” score. Past sleeps are saved to the SD card, and can be recalled on the device. It’s also possible to view the data on a PC, by using the SD card. On the PC you can view a higher detail level than on the screen. The Zeo Mobile is the second product that came out, and is the most popular. There are no significant differences between the Zeo Mobile and the Zeo Pro. At this time it’s only possible to use the Android app, or sideload it on IOS. The device consists of a charging dock, a charger (5v mini-usb), the Zeo main unit, and a headband/sensor pad. The phone connects over bluetooth, and is used to collect and view the data. 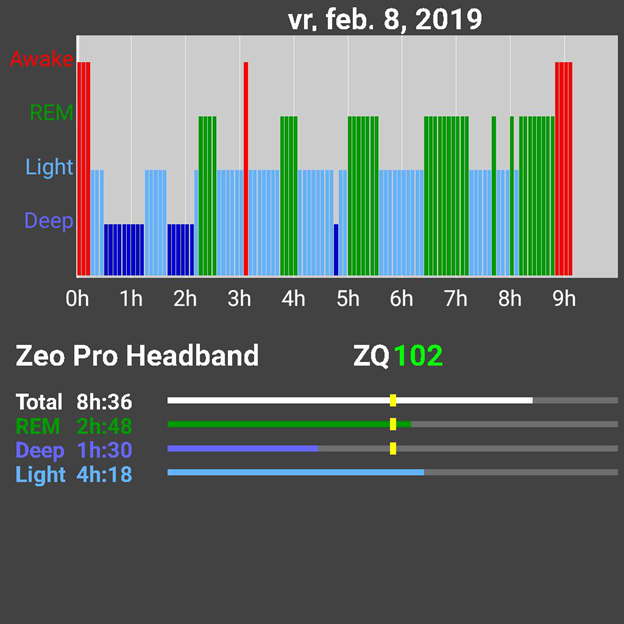 In case of connection loss, the Zeo can save one night of sleep on the device itself. Pressing the button makes the Zeo reconnect to the device, another press will upload the saved data. In the app you can view the hypnogram and the ZQ. In a notification bar you can see your current night’s progress. Due to this, the Zeo has a tendency to slightly overestimate the amount of REM sleep. Sometimes, if readings are bad, the headband is just too loose. The headbands are NOT compatible between versions. They have a different snap layout. Make sure you’re getting the right one if you’re buying them separate. There are also headbands available on ebay that have a different style and are supposed to last indefinitely, for $60 (+ shipping). These have not yet been evaluated. Using the Zeo Bedside, it’s possible to get a raw output signal, by connecting it with a serial cable. http://www.sleepstreamonline.com/rdl/starting.html This is currently being looked into. Because of Zeo going bankrupt in 2013, they are only available second-hand. On Ebay they are generally available between $50-80, depending on condition and completeness. You may also be able to find a great deal at a more local platform, so also check facebook marketplace and other local options. In the Discord there is the option to get the Marketplace tag; then you’ll be tagged if a new deal is spotted. If you find a Zeo, make sure that you’ll be getting parts 1-4 from the above lists! Depending on where you get your Zeo from, the power plug may not match your local outlets. The supplied plugs work on all voltages, but you may require a travel adapter. Alternatively, the Zeo Bedside works on a 5v 500mA adapter with a 5.5mm diameter round plug, with a length of 10mm. The Zeo Mobile/Pro works on any Mini USB cable connected to a power source. So, if you find a deal without a charger, don’t despair.